Scientists have spotted a real-life Tatooine — a world with two suns, like Luke Skywalker's home planet in the "Star Wars" films — and you should be able to see this alien star system, too, using a good pair of binoculars. Astronomers announced the discovery of the alien planet, called Kepler-16b, today (Sept. 15). The Saturn-mass planet orbits a pair of stars known as Kepler-16A and Kepler-16B. 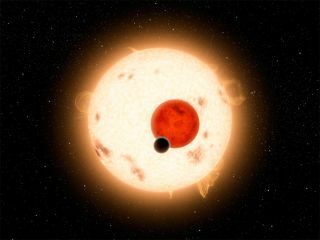 Someone on Kepler-16b would see two suns hanging near each other in the sky, just as Luke did on Tatooine. The Kepler-16 star system is just 200 light-years from Earth, in the constellation Cygnus (the Swan). Because it's so close, it should be visible to many amateur skywatchers, researchers said. The sky map of Cygnus here shows the constellation as it currently appears high overhead at night. This sky map shows the configuration of stars in the constellation Cygnus (the Swan), which currently appears overhead in the night sky. The bright star Vega is identified as a reference star. The binary Kepler-16 star system, which is home to the Tatooine-like planet Kepler-16b, can be found with telescopes and binoculars within the constellation. Cygnus has three stars in its right wing, Doyle said. The key is to find the bright star in the middle, called Iota 2 Cygni, which shines with a magnitude of about 3. Seeing the point of light representing the Kepler-16 system would be neat enough. But next year, amateur astronomers may actually get to spot the newfound alien planet Kepler-16b — or, at least, see some evidence of the existence of this circumbinary planet. NASA's Kepler space telescope detected the exoplanet by noticing the telltale dips in brightness caused when Kepler-16b passed in front of its parent stars. It will make another transit on June 28, 2012, dimming the star Kepler-16A by about 1.7 percent, according to Doyle. The transit will occur during daylight hours in the United States and Europe — but much of Asia will be invitingly dark. "That will be visible from China, India, Russia, Korea and Japan and so on," Doyle said. "So if you're an amateur and you want to detect the first transit since the discovery of a circumbinary planet, you can go to the northeastern hemisphere of Earth." A 1.7 percent drop in a star's brightness is something amateurs with a decent telescope and CCD (charge-coupled device) imager can pick up, Doyle said. Off-the-shelf versions of this equipment would be fine, he added.